...I boarded my flight at Heathrow, bound for Ahmedabad. Twelve months later, I'm sitting here in my office overlooking the Keizersgracht in Amsterdam, living a life that could not really be any more different from that which I experienced during my time in India. It has been quite a year for me, including India, summer in the Netherlands writing my thesis and completing my Master's degree, and travelling in the USA, Colombia and various places in Europe. After a lengthy job hunt, I decided to decline the offer to work with KfW in Delhi, leaving international development for the time being, and try a job in the travel industry: why not work with what I love doing? In order to show you all that I actually did something other than travel and eat ice cream in those four months, here's a link to my Master's thesis, entitled Male youth, gender, and development: Lived experiences of male youth in the context of change in Ahmedabad, India. My most sincere thanks, once again, to everyone that took the time to read my ramblings during those months in India, and to the people I was fortunate enough to encounter during my time there that helped to make it such a memorable experience! Saturday afternoon in the old city, Ahmedabad (March, 2014). Perhaps I'll write another blog someday (I've been intending to for a while, but life keeps getting in the way), but should you wish to keep up with my adventures (or lack thereof), feel free to follow me on Instagram (@sambowers27) or Twitter (@sambowers27). Return to Rajasthan, and goodbye to Gujarat. This last entry is long overdue, and I’ve now been happily settled back into life here in the Netherlands for almost four weeks. Nonetheless, I’m not one to leave something incomplete, so here’s a brief (really, very brief) account of my last couple of weeks in India. I left Delhi by train and headed far west into the Thar Desert and Jaisalmer. It was a very long journey: eighteen hours to be precise. However, I had managed to get a first class ticket, and enjoyed the company of a lovely Dutch couple in my compartment for the duration of the trip. Arriving in Jaisalmer was surprisingly calm, despite the oppressive heat (around 50°C). The city of Jaisalmer is dominated by its huge fort, which rises majestically out of the desert landscape. My hotel was actually inside the fort, which was of course rather magical. The city itself was largely deserted during my stay, it being the middle of summer and extra-low tourist season. After the sheer manic nature of Delhi and Agra, this came as somewhat of a relief. Jaisalmer is relatively small, and its main attractions (or at least the only ones bearable in the summer heat) are three beautiful havelis, and the city palace. The Patwa Ni Haveli was by far the most impressive, with its multitude of beautiful carved balconies and intricately crafted decorations. As is seemingly standard with many Indian heritage sites though, the audio tour was a little disappointing. The same can be said for the city palace, although its majesty more than makes up for the poor quality of the visit experience. Built in 1156 by the Bhati Rajput ruler Jaisal, it boasts a rich and fascinating heritage. Nights in Jaisalmer brought some welcome relief from the heat, and gave rise to the wonderful spectacle of (probably) thousands of bats flying above the fort, gliding on the currents of warm air rising from the stones. In Jodhpur, I stayed in a charming little hotel near the fort. Jodhpur’s fort is often considered to be one of the finest in India, and I must admit, that I was impressed – even the audio tour was good (apart from a few contradictions in its content). Beyond the Mehrangarh Fort, there isn’t really too much to see in Jodhpur, and with its unpleasantly narrow, congested and noisy streets, and the oppressive heat, hardly a delight to explore. It was therefore just a few days in which I was able to relax and begin to prepare myself for coming home. View of Jodhpur fort from my hotel. Nonetheless, the Mehrangarh Fort is certainly impressive – even the visitor experience wasn’t too shabby, including an excellent audio tour, well-preserved museums and interiors, and even a decent gift shop! Rudyard Kipling wrote in 1899 about the fort: "The work of angels, fairies and giants . . . he who walks through it loses sense of being among buildings; it as though he walked through mountain gorges . . ." and I am certainly inclined to agree with his words. The looming 15th-century edifice to Rajput valour has walls that soar like sheer cliffs 120m high, literally dwarfing the city at its base, and a proud history of never having fallen to its many invaders. The interior is a sumptuous series of palaces, museums, which are both beautiful and in places a little quirky, including a ceiling decorated with multicoloured baubles. View over Jodhpur from the Mehrangarh Fort. After a few days of drowning in my own sweat and sitting too close to an air conditioner in Jodhpur, one final train whisked me (well, it took 10 hours) back to Ahmedabad, for a couple of truly delightful days catching up with friends, eating some delicious Gujarati food (including ice cream) and saying my goodbyes. I was also fortunate enough to be invited to the inauguration of Saath’s Meghdhanush initiative, which works towards raising awareness about and ending child labour. I really look forward to seeing this inspirational programme grow and make an impact in the coming years. And so, this entry and therefore the blog must come to an end. Apologies if this last post has been a little short and lacklustre, but there really wasn’t too much to say about my last couple of weeks, apart from how special my last few days in Ahmedabad were, and how much I’d like to thank everyone who made my time in India so memorable. I really look forward to seeing you all again some time in the future! 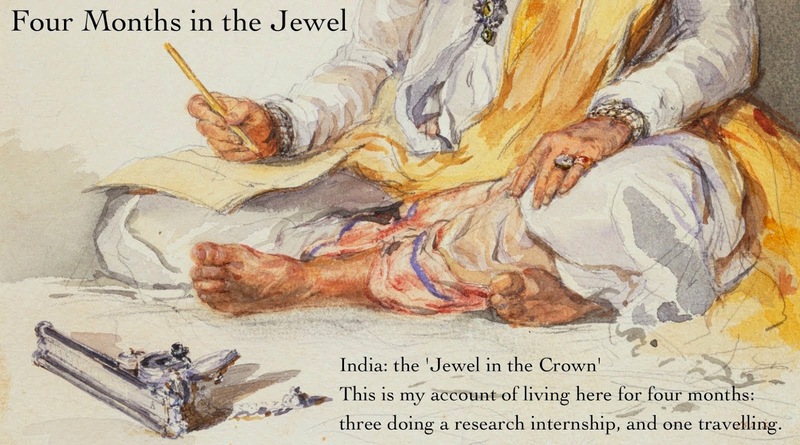 As and when I finish my thesis, I’ll post some kind of review or summary of my research here, and any final thoughts or reflections I have on my time in India. Until then, all that’s left to say is my most sincere thanks to you all for taking the time to read this, and all of my other ramblings over these past few months! Seven days in the capital. Where to begin with Delhi? Like Mumbai, India’s capital and second-largest city, Delhi is vast, and sprawling. It can be roughly divided into three parts: Old Delhi, New Delhi, and South Delhi. Old Delhi is exactly as the name suggests, old. It was built by the Mughals in the seventeenth century, and today remains a predominantly Muslim part of the city, with many narrow lanes and bazaars, teeming with life. Personally, I really disliked Old Delhi, and did not enjoy even one single moment its chaotic mess of people and traffic. For me, it was all of India’s worst aspects thrown into one place. I’ll come back to Old Delhi later. New Delhi, the capital built by the British is certainly unique, and undeniably impressive. Its wide, tree-lined avenues flanked by impressive buildings with colonnaded façades, wherein shops, museums and important government buildings can be found. The heart of New Delhi is Connaught Place, an enormous circle, where you can find everything from saris to Starbucks. Finally, South Delhi is home to much of the city’s new developments of businesses and seemingly endless suburbs of modern housing and shopping malls, catering to India’s growing middle and upper classes. I spent many lovely hours in the malls of South Delhi with Lena, getting back into my ice-cream habit, appreciating the air conditioning, and of course observing the fascinating stratum of Indian society that frequents such places. I also bought a new pair of glasses. Having spent an entire week in Delhi, I’m struggling to remember what exactly I did on a day-to-day basis, seeing as it was mostly just exploring random places that I came across in between stopping for a drink to escape the heat. Being me, one of the first things I sought after were museums. On this front (unlike Calcutta) Delhi did not disappoint. My first visit was to the National Museum, which I eventually reached after a lengthy argument with my rickshaw driver who initially had sworn blind that the National Archives were without any doubt the National Museum. They are in fact, not that far apart, but I was not prepared to walk the 500 metres in the blazing heat, especially when I’d paid to be taken to the museum. Rickshaw drivers in Delhi are probably one of its downsides, they did not seem friendly at all (unlike most of those in Ahmedabad) and always appeared to go out of their way to cheat a foreigner. Anyway. The exhibition was very well laid out and presented, and gave me a great insight into how the body, life and death, are understood and represented in Indian art and culture. The next museum was the National Gallery of Modern Art. Sadly, I was not allowed to take photographs, but I cannot recommend a visit to this museum highly enough. Its huge collection is showcased across several floors of well-lit, airy galleries, containing some of the best modern art I’ve seen in a while. I learned a great deal about movements that I had no idea even existed, and came away with a newfound appreciation for the Indian art scene. As we left the museum, the humidity outside was painfully intense, and the sky was growing grey. Lena and I hopped in a rickshaw bound for Connaught Place, but around halfway into the journey (just after passing the rather unimpressive India Gate), the storm began. A good 10-15 minutes of high winds and dust storms, followed by a huge downpour. Not a good time to be in a rickshaw. It even made the news, having blown away a part of Humayun’s Tomb (words about my visit there to follow shortly), and delaying many flights into the airport. Stormy evening in Connaught Place. Delhi’s metro system is a life-saver. It’s air conditioned, modern, and connects many parts of the city that would cost you a great deal to get to in a taxi or auto rickshaw. Sadly, most of those who use it do so in a rather erratic and crazy way, pushing and shoving to get onto the trains like their lives depend on it, even when they’re not even crowded, and then insisting on sitting down for a 5-minute journey when there really aren’t any free seats, just making you move to accommodate them, meaning that everyone else is then very uncomfortable. My favourite moment (and most irritating) was probably being asked to move up one seat so that two friends could sit together, and then that same person telling me to get out of the seat I’d moved into for him, because it was reserved for ladies. India does truly try my patience at times. Thanks to the metro, I was able to travel to the south of the city and visit the Qutab Minar complex. Here stands the first monument of Muslim India, and one of Delhi’s most famous landmarks. Built in the early thirteenth century the tower stands over 72 metres high, and is (I think) the world’s tallest brick minaret. Because you know, there are so many other famous tall brick minarets… Either way, it’s very impressive, and certainly huge. The tower tapers up above the ruins of a complex of palaces, gardens, mosques and various other buildings, all covered with beautiful carvings and inscriptions of Koranic verses. It was like a historical wonderland to explore, and I could have easily spent hours there, but after about two, I was almost drowning in my own sweat. Lovely image, I know. Carvings at the Qutab Minar complex. The next morning, I made my way through Old Delhi, past the Jama Masjid (saving a visit to that for next time when I can appreciate it in better weather), to the Red Fort (or Lal Qila). Along the way my rickshaw driver pointing out where I could find prostitutes. Apparently, in Delhi, they are far more expensive and nowhere near as good as those in his home city (Kolkata), where you can get almost anything you want for Rs. 250. Another image of Old Delhi that I’ll be in no hurry to remember. My driver dropped me at the wrong gate of the fort, which meant a rather long walk to the entrance. I wasn’t too happy about this, but it did allow me to appreciate the fort’s magnificent red bastions, which meander for a great distance around the complex. Interestingly, one stretch of the moat contained a large swathe of fragrant bushes, which, on closer inspection turned out to be cannabis. I’m no expert on the botany of marijuana, or its legality in India, but there was something a little suspicious about this enormous, but seemingly well-tended patch of plants hiding in plain sight in this quiet corner of the city. Guarding his nation's heritage, Red Fort. Eventually, after battling through the crowd at the ticket counter and the usual slow-moving queue for a pathetic security check that any idiot could get a bomb through (can I say that?) I made it through the great Lahori Gate and into the fort. Yes, it’s big, yes the buildings inside are pretty, but to be quite honest, Delhi’s fort is probably the least impressive I’ve seen so far. It’s somewhat lacklustre, and the wide spread of structures that can be visited detract a little from the magic that India’s other forts have. Don’t get me wrong, some of the halls and palaces are most beautiful, but there was something about the Red Fort that just didn’t enchant me. I enjoyed browsing the funky Oxford Bookstore and drinking tea in its charming Cha Bar far more. Lena, Vogue, Tea: Cha Bar. Being a bit of a Disney addict, and needing a break from tourism, I decided to go to the cinema to see Maleficent. Indian cinemas smell indescribably strange. I won’t talk about the film, but will describe the cinematic experience a little. The ticket was only Rs. 200 (£2), which isn’t bad at all for a 3D film in the centre of a capital city. The 3D glasses are made of paper though, and they make your vision darker, something which unfortunately the projectors do not account for, meaning that the entire film was a tad dim. The 3D also came and went at random. Oh, and there’s an interval, wherein the film suddenly stops for about 10 minutes, right in the middle of a scene. What is it with India and prolonging everything? Lena and I spent a few hours that Sunday afternoon in a bar/restaurant on Connaught Place. Reached by its own elevator from street level, it was simply hilarious. The interior was huge, filled with leather armchairs, and quite dark. Loud, thumping, lyric-less music pounded, competing with the chatter of half of the city’s upper middle class youth, apparently trying to find the most obnoxious way possible to spend their time. I don’t think so many selfies have ever been taken in a room in such a short space of time. The experience was interesting, but also a little worrying. There were the usual awkward public displays of affection, and a general air of superiority among the customers. Not only could one forget about the time of day and weather outside, but that a world beyond the exposed-brick walls existed at all. Moving on… the last item on my agenda for Delhi was Humayun’s Tomb. Think Taj Mahal, but more red, smaller, not quite as pretty, and with about a thousand fewer visitors. Delhi’s first mausoleum, it was built to house the remains of the second Mughal emperor, Humayun. The tomb is extremely elegant, constructed in the Persian style, in red sandstone, inlaid with black and white marble, and stands on a podium overlooking extensive gardens and the Yamuna River. The octagonal structure is crowned by a dome, part of which was damaged by the aforementioned storm. This garden tomb is often considered to be a prototype for the Taj. It is without a doubt, spectacular, and apart from the noise of the trains from nearby Hazrat Nizamuuddin station, a veritable oasis in this vast metropolis. Delhi, like any megacity, is full of delights, disappointments, and – in true Indian style – contradictions. I defy anyone not to be mesmerised by its vivacity and the incredible way in which it reflects, forms, and dominates India. It’s an exhausting but truly fascinating place. A harsh environment, but one which inspires. During my time in Delhi, I had an interview for an internship with KfW, a German government-owned development bank. If all goes to plan, I’ll be spending five months working in their New Delhi office, as of mid-January 2015. Exciting! There’s so much more of Delhi to see, and thankfully it looks like I’ll have the opportunity to explore it all sooner than expected. I do think I need the next few months in Europe to recover first though. Agra did not begin well. Some advice: if you can avoid flying with Air India, do so. You’ve heard of ‘shabby chic’, well Air India’s planes take this to an extreme, although I don’t think there’s any intention of ‘chic’ in their ‘shabby’. The landing at Agra was also mildly terrifying, with the plane hitting the runway with a huge thump, and swerving violently. And now for the best bit: only 15 people boarded the flight at Varansi, and only around 8 disembarked in Agra. Despite this, the airline managed to lose my luggage. After accusing me of checking-in late, and searching the hold a few times, they conceded that they had lost my bag. If you know me, you’ll know of my love for complaining. Boy did I make a fuss. The manager looked genuinely terrified, particularly when he explained that there were no more flights into Agra until Monday (this is on Saturday, I was leaving on Monday). I was eventually dismissed with pathetic apologies and Rs. 1500 (£15). Turns out, I made enough of a fuss that when Air India located my bag (somehow it had made its way to Mumbai), it was sent immediately to Delhi, and then by overnight courier to Agra. Ok, rant over. Agra was India’s capital under the Mughals, and is, along with Jaipur and Delhi, an apex of India’s ‘Golden Triangle’, the most popular tourist itinerary. Personally, I would not recommend Agra for more than a day and night (if necessary). Its sights may be splendid, but the city itself, and especially the Taj Ganj area, is quite awful. There are endless touts, a lack of decent infrastructure, and disappointing cuisine. After the luggage drama was resolved, Lena and I made our way to Agra Fort, which is surrounded by imposing red sandstone ramparts, dominating a bend in the Yamuna River. It was built between 1565 and 1573 by Akbar the Great, and remained the stronghold of the Mughal Empire for generations to follow. Entering through the Amar Singh Pol, the fort’s magnificent structure is evident and beautiful from the very start. There are clever defensive measures throughout, including slopes, walls and gates placed at right-angles to each other in order to disorientate and deprive attackers of space. One of Agra Fort's imposing gates. There are various beautiful courtyards and gardens, including those which surround the Diwan-i-Am (Hall of Public Audience), which is a very pretty structure consisting of arches and pillars, open on three sides. The vast amounts of marble decoration and inlay work throughout the fort and its various mosques and pavilions is stunning. Looking from the citadel over the river, city and to the Taj, its easy to see why this strategic spot was chosen for the fort. Royal pavilions and gardens, Agra Fort. It was, of course, filled with throngs of Indian tourists, slowly shuffling around, stopping in places for no reason, and asking us to have pictures with them. I’m more than happy to do this, although it never fails to strike me as a little odd. While it was acceptable for Europeans to have their photographs with ‘exotic’ people a hundred years ago, I doubt if I were to ask a random tourist on the streets of Amsterdam or London to have a picture with me, it might not go down too well. Also, it totally baffles me that although Indians seem to be among the most impatient people I have ever encountered, they move so incredibly slowly! View over the river and Taj, Agra Fort. From the fort, we got back into our electric rickshaw (so much more smooth, quiet and eco-friendly than a conventional auto), and stopped at Mehtab Bagh (gardens) for a view of the Taj from across the river. Being a park in India, obviously it was full of young couples having intimate moments in the bushes. It’s hard to know where to look. On Monday morning we visited the Taj Mahal. Yes, it’s a bit cliché, but it really is outstanding. From the moment one enters the complex, it’s hard not to be moved by the wonderful symmetry and sheer beauty, remaining undiminished by the enormous crowds of visitors and oppressive heat. From the way the white marble glistens in the sunlight to the romantic story of its construction, the Taj Mahal is truly a wonder. Shah Jahan built the Taj to enshrine his favourite wife, who died shortly after giving birth to her fourteenth(!) child in 1631. The emperor was so devastated by her death that he wanted to build an unsurpassed monument to her memory. ‘Taj Mahal’ is a shortened, informal version of his wife, Mumtaz Mahal’s palace title. Construction took over twenty years, with a workforce of over 20,000 from across Asia, and materials including the marble and semi-precious stones for decorations from across India, Asia, and the Indian Ocean. Approaching through the gardens (more picture with random Indian families), the mausoleum and its surrounding minarets are breathtaking. Every detail is so careful and beautiful, and the symmetry is just perfect, even down to the jawab, a replica mosque (it faces away from Mecca) built just to preserve the architectural aesthetics of the complex. Postcard-view of the Taj Mahal. We left Agra on Monday evening, bound for Delhi, where I spent my birthday on Tuesday, including a delicious lunch (and a gin and tonic), and tea and cake with Lena at the delightful Hauz Khas village. On my birthday last year, I sat one of my final exams in Oxford, entitled ‘Contemporary India’. It’s funny how things work out. I missed being with more friends and family yesterday, but I had a brilliant day nonetheless. Many thanks for all of the lovely Facebook posts/messages, WhatsApp messages, Snapchats, Tweets, e-mails etc. etc. – it’s wonderful to be remembered, even though I am so far away! As a birthday treat to myself, I booked a little overnight trip to Amritsar, including a night in a fancy hotel. I flew up from Delhi last night, and visited the fabled Golden Temple earlier today. Anil Joshi, a BJP cabinet minister, was on my flight. The plane was tiny. Amritsar is the Sikhs’ holy city, close to the Pakistan border, and the largest city in Punjab. It was founded in 1577 by Ram Das, the fourth Sikh guru. In the twentieth century, it was rocked by a series of horrible massacres, including the killing of thousands of unarmed civilian demonstrators by British troops in 1919, high levels of communal violence during partition, and Operation Blue Star in 1984, which involved a parliamentary attack on the Golden Temple, four months later resulting in Prime Minister Indira Gandhi’s assassination by her Sikh bodyguards. Spiritual centre of the Sikh faith, the Golden Temple consists of the gleaming, gilded Harmandir at the centre of a rectangular lake, surrounded by white marble shrines, bathing ghats, and the Guru-ka-Lagar, the titanic communal canteen. It provided free food to all, as sharing food with strangers reinforces one of the tenets of Sikhism, the principle of equality, insitaged by the third guru in the sixteenth century to break down caste barriers. I did indeed feel most welcome at the temple, much more than I have at almost all other religious sites I’ve been to in India. Despite wearing a bright orange scarf on my head, and being about the only foreigner there, barely anyone even seemed to notice me. Every Sikh tries to come on at least one pilgrimage to the Golden Temple during their lifetime, in order to hear the musical readings of the Adi Granth (I couldn’t understand them, but they were nice to listen to), and bathe in the purifying waters of the Amrit Sarovar (‘Pool of Immortality-Giving Nectar). It had some really pretty fish as well. Amritsar is a friendly place, and the Punjabi food is excellent. I’m heading back to Delhi this evening and spending another 5-6 days there. It’s vastness and hustle-and-bustle will probably take a bit of getting used to, but that’s all part of the fun. Let the adventure continue! “Older than history, older than tradition, older even than legend, and looks twice as old as all of them put together.” – Mark Twain’s famous quote about Varanasi, or Banaras/Benares as it is also known. The city is indeed old, having had religious life present since the sixth century BC, and is the centre-point of the Hindu universe. Situated on the banks of the vast River Ganges, the maze of alleys which makes up the Old City, the ghats which line the river, and the endless stream of pilgrims pouring through give it a very special feeling. I’m not really one for religion or spirituality, but there is certainly something about Varansi that makes one feel different. I stayed at the charming Ganpati Guest House (itself a renovated ghat), where I met two lovely American ladies who had been on my flight from Calcutta, with whom I would spend my time in Varanasi. By the way, ghats are the sets of stone steps (and the palaces, pavilions, and terraces) which line the river – the are 100 in Varanasi – and serve as sites for bathing, laundry, and rituals etc. Our first morning consisted of a tour of the labyrinthine streets of the Old City, with stops at the Nepali Temple, Alamgir Masjid, and Golden Temple, as well as various smaller temples and shrines along the way. The Nepali Temple is around three hundred years old (according to our guide) and is a Kathmandu-style wooden structure, dedicated to Lord Shiva, with beautiful carvings, including depictions of various positions from the Kama Sutra. Whispering a wish to the bull for Lord Shiva. The Alamgir Masjid stands on the ruins of a Vishnu temple that was later replaced with the mosque. It is a testimony to favourable Hindu-Muslim relations as it is on the site of the initiation of the saint Kabir, the son of a humble Muslim weaver who is revered by both Hindus and Muslims. Despite its minarets now being much shorter than they once were, the structure remains magnificent, and casts an impressive silhouette over the river at dawn and dusk. With non-Hindus not being allowed into the Golden Temple, we made do with glances of its gilded spire from surrounding buildings. It is by far Varanasi’s most popular temple. There was also a brief and rather awkward stop at an aromatherapy centre (tourist trap) during which I managed to suppress my scoffs (sorry, but I don’t believe that rubbing oil on the skin is going to cure arthritis or stop me from getting spots), and from which we made a swift exit after the ‘headache cure’ oil reacted with my skin and made my eyes water. Some of them did smell quite nice, though. Following a long afternoon walk along the ghats (yes, the weather did allow such, surprisingly!) we took an evening boat ride up to Manikarnika Ghat, the city’s biggest burning ghat, where cremations take place. We’d seen several corpses being carried through the streets during the day, and now witnessed their submersion in the river and subsequent burning. Whilst not entirely comfortable at this being a tourist spectacle, the process is very much public, and an interesting and edifying insight into Hindu culture. We then watched the group of priests at Dashashwamedh Ghatperform Agni Pooja ceremony (Worship to Fire) wherein a dedication is made to Lord Shiva, River Ganga, Surya (Sun), Agni (Fire), and the whole universe. Ceremonies at Dashashwamedh Ghat from the boat. Friday morning started painfully early, with a 5am boat ride to watch the sun rise over the Ganges. I was bleary-eyed to say the least, but the glorious sight soon roused me, it was simply extraordinary. We continued in the boat along the ghats, watching them come to life with bathers, swimmers, launderers (sheets and clothes, not money), and priests. The sweltering afternoon (the nice weather was never going to last), brought with it a trip to Sarnath, a village 10km north of Varanasi. In 530 BC, Buddha gave his first ever sermon here. Upon this site now stands Dhamekh Stupa, a 33.5m high tower, decorated with geometric patters and bas-relief foliage. Buddhist communities from other countries are also represented in the village, and have their own temples. Those represented include Tibetan, Chinese, Japanese, Thai, and Burmese communities. We visited a couple of them, but apart from their religious significance, held little interest for non-Buddhist or those (such as myself) with very limited knowledge of the philosophy. The Thai temple had an enormous statue of Buddha. On one of my usual find-the-post-office missions (I send copious amounts of postcards) I came across a snake-charmer in the street. He tried to get my attention by shaking his basket at me, which contained a very large black Cobra. Needless to say, I almost fainted. Not many people can move through the tiny streets of Varanasi as quickly as I did at that moment. That evening, we watched the ceremonies on Dashashwamedh Ghat amongst the crowds around the priests on the ghat itself. And also, the city is full of cows, and the river full of buffalo. I’m sitting writing this at Varanasi airport while waiting for my flight to Agra, where I’ll meet Lena, and visit the Taj Mahal, my fourth ‘Wonder of the World’. I can’t wait. The City of Joy, really? Flying into Varanasi this evening as the sun set over the broad curves of the Ganges and its vast plains was quite a sight to behold. It was also a great relief to be leaving Kolkata. Don’t get me wrong, the city has a fascinating history and some beautiful sights, but so many drawbacks that I’ll be in no hurry to return. It’s known as the ‘City of Joy’. I don’t know how old this nickname is, but it certainly seems outdated. Kolkata, or Calcutta as it used to be known, is one of India’s great urban centres. It was the capital of the British Raj before the move to New Delhi, and perhaps once the greatest colonial city of the Orient, with traders flocking from across the east in the past, contributing to its cosmopolitan population. However, since Independence and various events throughout the twentieth century, huge numbers of migrants and refugees have pushed the city and its infrastructure to its limits, resulting in widespread, extreme poverty, horrendous traffic, and terrible pollution. The climate at this time of year was also extremely unpleasant. Still, I did venture out as much as possible during my few days in Kolkata, in order to admire its array of beautiful (if mostly crumbling) Victorian architecture, and experience its hectic atmosphere. My first stop were the ghats along the Hooghly River near the mighty Howrah Bridge (the world’s third longest cantilever bridge at 705m). I wasn’t sure what to expect exactly, but apart from great views of the bridge, all that I encountered were slums, rubbish, and people bathing in the filthy river. I didn’t know where to look, or how to react exactly. Standing there with a camera snapping away pictures of the bridge while children openly defecated into the river a few metres away. I must have looked quite ridiculous. After dragging my feet through the old city (and the humidity), admiring the grand edifices that once contained the administrations and businesses that made this bastion of imperialism tick, I visited perhaps the most spectacular colonial edifice in the city and Kolkata’s pride and joy: the Victoria Memorial. The extraordinary white marble structure was conceived by Lord Curzon and finished in 1921. It’s set in beautiful gardens, which include ponds and shady gravel paths – it’s actually rather green and lush, for an Indian park. The museum inside contains various momentoes of British Imperialism, as well as some fascinating paintings, documents and photographs about life in the city and the Independence struggle. Just across the road is St. Paul’s Cathedral, built in 1847. The Gothic structure is quite beautiful, and contains a lovely window by Sir Edward Burne-Jones. Sadly, I wasn’t allowed to take any pictures, and the nave was closed to visitors. Of course, I need to mention food. The weather in Calcutta really killed my appetite, but I did take advantage of the fact that there is a large Chinatown, where I had some delicious dishes. Before I forget, something I did love about Kolkata: the taxis. They’re all bright yellow Hindustan Ambassadors, and very cheap. The roads are basically streams of yellow – fantastic. Next up was the Indian Museum. Billed as India’s oldest and largest museum, designed by an Italian architect and built in 1814, I was expecting something impressive. I was very much disappointed. There were a few ‘nice’ galleries of textiles and archaeological finds, but it was mostly just big, old, and very dusty cases of all-very-grey-and-the-same-looking fossils, in stuffy, dingy galleries. The zoological displays were simply terrible, with most of the specimens looking older than the museum itself. The marine dioramas were particularly giggle-inducing, with their discoloured googly-eyed stuffed fish pinned to blue walls, ‘swimming’ with bemused expressions on their faces. ...and its not-so-impressive zoological collection. For me, Kolkata was a little disappointing. Maybe I need to experience it during the winter, or with a local, but still, I think something needs to be done about its over-stressed urban infrastructure and extreme poverty before it can become the glorious metropolis that it has the potential to be. Watching Eurovision in India was certainly different. Trying to explain the concept to my friends was no easy feat, and considering the time difference, it didn’t end here until almost 4.30am. Everyone else was asleep by around the twentieth performance, but needless to say, I remained alert and overexcited throughout. Conchita really stole the show, and despite the UK not doing too well, it was wonderful to see the Netherlands come second! I can’t wait for Vienna 2015, congratulations, Austria! Back to India. I’ve just arrived in Kolkata (Calcutta) after a few days in Mumbai (Bombay). I was sad to leave Saath and Ahmedabad behind, but the next few weeks look to be quite the adventure. Mumbai was like nothing I’ve ever seen before. Toyko, London, and Rio all pale in comparison to the sheer immensity of Bombay. Arriving at the airport was like stepping into another world, one which seemed to just drip money. The arrivals hall was full of the richest Indians I’ve seen so far, and what felt like half of the wealthy population of the Arabian Peninsula. This continued into the car park, which teemed with top-of-the-range BMWs and Mercedes. That said, it's a megacity in the Global South, so is of course not without extreme poverty and devastating inequality, and is even home to Dharavi, one of the world's largest slums. In the downtown areas, the British colonial heritage shines through strongly. The architecture, layout, and cosmopolitan atmosphere (not to mention the red double-decker buses) can’t help but remind you of London, but on some kind of tropical steroids. Mumbai was a good ten degrees (Celsius) cooler than Ahmedabad, which was certainly a welcome change, with delightfully balmy evenings. I found it very interesting, and almost a little disconcerting how most of the Indians around me were conversing only in English or Hinglish. Progress or a loss of identity? I began my visit – in my usual style – with a trip to a museum: The Chhatrapati Shivaji (or Prince of Wales) Museum. The old names still stick quite strongly in Mumbai, which is handy, because the Indian-ised ones are a bit of a mouthful at best. The museum is housed in a magnificent building in the Indo-Saracenic style, and stands in a grand garden. The collection includes some excellent ancient sculpture, as well as the usual collection of weapons. My personal highlights, however, were the stunning collection of Chinese jade pieces, and the Indian painting, especially the miniatures. The selection of Western art contained a few nice pieces, but nothing that really blew me away. Indian painting at the Chhatrapati Shivaji Museum. The Jehangir Art Gallery (contemporary art) and National Gallery of Modern Art were both closed. Fortunately, the Goethe Institut next door housed a fascinating photographic exhibition about Germany and India, in conjunction with the European Union Film Festival in India. I even caught the last film screening on Thursday evening, which happened to be Killing Bono, from the UK, it was rather funny. I wandered around Oval Maidain, the High Court, and Mumbai University (sadly Gilbert Scott’s Rajabhai Clock Tower was in scaffolding), and then after lunch decided to head for the handsome Gateway of India. The honey-coloured arch was built to commemorate the visit of King George V and Queen Mary in 1911, and was completed in 1924. Originally intended to be a ceremonial point of arrival for P&O passengers, it is more commonly associated with August 1947 and the moment when the last British soldiers in India marched onto a ship as the Union Flag was lowered. The Gateway is very much a symbol of power, majesty and imperialism, and despite its connections with that important moment in India’s independence, the way in which Indians admire and flock to have their photographs taken in front of it does confuse me a little. After taking several selfies and eating a little too much bhel puri, I had a stroll through the Taj Mahal Palace Hotel, the city’s swankiest joint, and scene of the horrific 2008 terror attacks – not that you’d know, the subsequent refit has really restored the splendour. I like the Taj, and not just because it’s fancy, but because it was built in the face of colonial oppression by J. N. Tata, as revenge for being denied admittance to Watson’s, the city’s best and a “white’s only” hotel. Watson’s is long gone, but the Taj remains. It’s actually not that expensive to stay there either, with rooms starting at around Rs. 8000 (£80/100€) a night. Friday (16th May) was election results day, which meant a lot of road closures in the city and no alcohol for sale. Just when I was getting used to having gin & tonics back in my life. I took a stroll up to Horniman Circle and its lush gardens, surrounded by grandiose colonial-era buildings with their paved arcades sheltering banks, boutiques, and a Starbucks. As I passed the Bombay Stock Exchange, I was given some free sweets by people celebrating share prices soaring after the election. I might not be Modi’s biggest fan, but I did like the sweets. Eventually I made it to Chhatrapati Shivaji Terminus (or Victoria Terminus). What a sight. The enormous edifice was designed by F. W. Stevens and built in 1887. It really is rather barmy: a huge collection of spires, domes, columns, minarets, all in red brick. Inside it’s rather beautiful, and certainly reminiscent of St. Pancras in London, but the niceties stop with the architecture: the concourse is hectic, filthy and seemingly total chaos. The heat did not help. I was determined not to let Mumbai’s intensity get the the better of me, and so spent my last day wandering around, enjoying its energetic and lively vibe, including passing by the police headquarters, where I had a little moment of excitement about following in the footsteps of Inspector Ghote. The day was topped off with an evening stroll along Marine Drive, the city’s seaside promenade. It was built in the 1920s, and is lined with peeling art deco buildings. At night, the street’s 3km curve is spectacularly lit by a row of lights that earned it the nickname “The Queen’s Necklace”. On my ride to the airport this morning, the taxi driver took the Bandra-Worli Sea Link (ok, it’s officially called the Rajiv Gandhi Sea Link), an impressive 5.6km-long viaduct/bridge which links these two parts of the city and greatly eases traffic and cuts cross-city travel times. The structure is extremely impressive, but then, I do love bridges for some reason. Mumbai totally mesmerised me, I’ll definitely be going back there one day. Strangest thing about Bombay: no cows. © Sam Bowers. All images © Sam Bowers, unless otherwise credited. Simple theme. Powered by Blogger.